TT Games recently announced that LEGO the Incredibles game would be coming to PC and consoles this Summer. The game will cover characters and moments from both the original movie as well as the new one coming out in June. On Thursday, the developers released a new Trailer that gives an exciting look at what’s in store for players, showcasing some of the humor, character abilities, and overall feel of the game. You can take a look at the new, “incredibly” fun trailer on TT Games YouTube channel. As fans of Disney/Pixar, The Incredibles, and LEGO games, we’re really looking forward to this upcoming release. And, after viewing the new trailer, it appears that we’re not going to be disappointed. 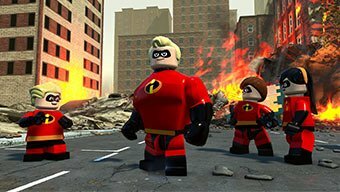 LEGO the Incredibles will be out on PC, Switch, XB1, and PS4 on June 15th, retailing for $59.99. Pre-orders are available on-line at Amazon, GameStop, Best Buy, and Target.